Now that I’m done with the Annapolis Classic Half Marathon, it’s time to move on! But I still have a few things on my mind when it comes to running. 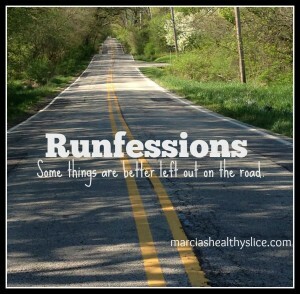 Good thing it’s the last Friday of the month, meaning it’s time to link up with Marcia’s Healthy Slice to share our“Runfessions”! I’m also linking up with Jill Conyers for Fitness Friday! Let it all out and confess what you’ve been holding back when it comes to your running and training! Has this not been an amazing season for running?! It also didn’t help that we had unseasonably warm weather this past month. Now that we’re finally starting to get cold weather in Philly, I’m a little sad! Now, I do love running in the winter, but I’m not ready for it yet! A few days ago I received the email notification that my race photos were ready from the Annapolis Classic Half Marathon. Well, I checked them out, and I couldn’t help but chuckle when I saw them…I look miserable! Check out the link for my race photos – which ones do you think I should buy? I love purchasing race photos because of the memories, good and bad. It was an ugly finish, but I’m still really proud of myself. And with all that I went through, I still doubt that I would have finished much faster than I did. At least I have a great story to tell! Do you know how long I’ve talked about this darn Turkey Trot on the blog?! Almost an entire year! After all the hype, I waited too long to sign up and this 8K point-to-point race in my hometown of Buffalo, New York sold out with 14,000 participants! I was really excited about this race because I’ve never run a race in Buffalo (besides my miserable year on the track team in high school), plus I do enjoy the 8K distance much more than a 5K. But we were still figuring out the logistics on coming up to Buffalo, so I procrastinated. This time, it didn’t pay off! So hopefully I can count on doing my first Santa or Ugly Sweater Run in Philly. Now that the half marathon is over, I just want to have fun! Last year, I participated in the #RWRunStreak, which consists of running every single day from Thanksgiving to New Years’ Day. I’m not the best at committing to fitness challenges, but the Run Streak is the only one that I’ve successfully completed, and I was obsessive about it! I ran a minimum of 1 mile a day, and no more than 4.5 miles. And I started to get faster! While the streak was a great way to maintain my fitness, I don’t want to go through the stress again this year, getting my runs in by any means necessary. Plus, my calves and shins HATED it. Do you have any runfessions? Share them in the comments, it’ll be our secret!